Secure All Security uses only the best systems to secure your corporate property. Our access control solutions enable you to protect your business while allowing you to manage and monitor the whereabouts of personnel on your premises. All our access control solutions are flexible and fully scalable to adapt to your changing security needs. Secure All Security also offers Professional Risk Assessments. Contact us to find out more. Secure All Security will take the time to analyse your circumstances and discuss your objectives before recommending any solution. Our chosen security system will deliver long-term practical benefits and will be a sound value-for-money investment for your home or business. YOU are under no obligation for the Secure All Security risk assessment. Once you have made contact with us we will arrange for an experienced technical surveyor to visit your premises and carry out a full site-survey. This will include discussions to determine your security concerns, plans for the business and your budget. Based on this data the surveyor will specify a security solution which will be outlined in a fully costed specification document. Access Control Equipment The Various Types Of Access Control Equipment The importance of access control cannot be understated. Companies stand the chance of losing millions in stock being stolen or equipment being vandalised. To ensure the effectiveness of you access control system, make sure the access control equipment is of the highest standard. Not only do you need the right equipment, but you should also be able to order new parts when there is a malfunction or an important element in the system breaks, and access to someone who would be able to install and fix your system if you are not able to do it by yourself. The various types of access control equipment needed include: Video footage for surveillance purposes Closed Circuit Television (CCTV) camera Lenses Housing for the camera Computer and hard drive where footage can be recorded onto Modem – access to Internet so that user can access footage from anywhere in the world Motorised garage door Garage door Motor to open the door Remote control to send the signal to the motor Bank account via an ATM Bank card PIN Fingerprint reader Fingerprint scanner Reader System network Sports stadium Gates Turnstiles Ticket Scanner While there are many different types of access control systems out there, their differences are major. Although some of them are fairly cheap to install due to the access control equipment not costing a lot, they may not be the most effective option. Some access control systems like a retina scanner may be very expensive to install and maintain, but it is way more effective than a system where a user has to make use of a key that can easily be lost or stolen. Access Control Security Systems The Ins And Outs Of Access Control Security Systems Limiting access to a building or facility is one of the easiest and most effective ways to increase the overall level of security. Access control security systems is a security concept that applies to a wide range of industries, including schools, large corporate campuses, financial institutions, government facilities, hospitals and countless others. These systems authorise who may enter a facility and who may not. Modern access control security systems often incorporate passwords, cards, PINs, retina/iris scans, fingerprint scans and many other access control elements. When access control security systems are installed and identification values are issued to users or subjects, it is important to ensure that: Each value should be unique A standard naming scheme should be followed The values should be non-descriptive of the user’s position or task The values should not be shared between the users There are three authentication factors to consider when installing access control security systems: Something a person knows, like a password or a pin. Unfortunately this is the least expensive option, but the least secure one. Something a person has, like an access card or a key. This option is very expensive, but also very secure. Something a person is – biometrics. The biometrics option is the most expensive, but also the most secure. Types of biometric authentication methods include: Fingerprint Palm scan Hand geometry Retina scan Iris scan Signature dynamics Keyboard dynamics Voice print Facial scan Handy topography The high-tech systems mentioned above also have very basic equivalents like a car alarm remote, a keypad for setting an alarm, a PIN used at an ATM and even a turnstile at a shopping centre. Access Control Systems Pretoria An Introduction To Access Control Systems In Pretoria Refusing or granting access to a person due to certain conditions is part of our everyday lives. To unlock your front door you need a key, you need a bank card and a PIN to gain access to the money in your bank account at the ATM, and you need an access card or your fingerprint to enter your place of work. Access control systems enable an authority to control access to areas and resources in a given physical facility or computer-based information system. Access control systems, within the field of physical security, are generally seen as the second layer in the security of physical structure. These measurements are not only a security measure, but also a way to keep track of people entering or exiting a building for example. Access control systems in Pretoria generally makes use of three types of authenticating information: Something the user knows, e.g. a password, pass-phrase or PIN Something the user has, such as a smart card Something the user is, such as a fingerprint, verified by biometric measurement Access control decisions are made by comparing the credential to an access control list. This lookup can be done by a host or server, by an access control panel, or by a reader. The development of access control systems has seen a steady push of the lookup out from a central host to the edge of the system, or the reader. Today’s access control systems often incorporate special ID badges featuring smart card or proximity card technology. When the cards are waved in front of an electronic reader, access is granted. With card-based access control systems in place, it’s much easier to prevent intruders from roaming freely throughout the premises. This allows you to know exactly who is in the building at all times, which is the primary goal of most access control systems. Biometric Access Control Biometric Access Control – An Introduction A biometric access control system makes use of a computerised method to identify people based on their physical characteristics before granting access to secure facilities. Cards or PINs can easily be broken, stolen, or lost. Biometrics are completely unique and unlike a card or PIN, they can never be used by someone else, lost or even left at home by accident. Biometric access control is more secure and reliable than any of the above mentioned systems. 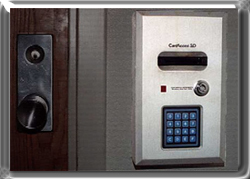 Any biometric access control system will consist of a biometric access control reader or scanner. This is the unit which captures the raw data in the form of fingerprint or information from iris scan, etc. This data is then analysed and compared to the person’s characteristics against the previously enrolled record. If the two records match, the person is authenticated. If the time is within the authorised period for entry, the device will signal and release the electric door lock, thereby granting access to a person through a biometric access control system. Benefits of a biometric access control system: The system can be used to monitor and limit access throughout a facility, ensuring employees and visitors alike only have access to approved areas. Whether from the end user’s point of view or that of the installer, a biometric access control system is easy to use and all administrative tasks can be performed by using a simple web browser. Due to the lack of server requirements and associated software support costs, post-installation costs are minimised. The time and attendance solution concept of a biometric access control system has helped many small as well as large businesses alike to combat various short comings. The most common aspect of biometrics being used for access control is fingerprints. The best solution for a small business is to opt for a fingerprint access control system. In more secure areas like government buildings and airports, iris/retina systems and other hi-tech approaches are being used. Fingerprint Access Control System The Benefits Of A Fingerprint Access Control System Only a few decades ago, the biometric fingerprint access control system was foreign to the world and something we only saw in movies. Thanks to the revolution of technology, biometrics is now very much a part of our everyday lives. A biometric fingerprint access control system offers a higher level of security than card access control systems, while providing the added convenience of not having to carry a card. Security is enhanced over card only systems, since biometric readers identify people, not cards. As technology improved and costs for biometric systems have come more into line with traditional card reader systems, fingerprint access control systems have replaced many of the conventional types of access control systems. Why a fingerprint access control system is considered so effective: Fingerprints are highly unique in nature and there is very little room for machine error. The system can easily record the entry and exit timings of each worker and thereby help in correctly deciding the corresponding remunerations. It can serve as a measure to restrict unwanted entrants to the area of work and can help in avoiding accidents. You cannot forget your fingerprint at home – unlike a key or access card. Your fingerprint cannot be stolen – unlike a key or access card. A fingerprint access control system saves manual labour. It eliminates possibilities of manual error. It ensures that users are present when requesting access. There is no need for constant changes in access codes or PINs. These systems are weatherproof and waterproof – perfect for indoor or outdoor use. Fingerprint algorithm is extremely accurate and fast. You can create and manager different areas, checkpoints, access schedules and rules for authorised access. Access Cards And Biometric Readers Limiting Entry With Access Cards And Biometric Readers Access cards and biometric readers both need to work in conjunction with automated door locks or gate and garage door motors. There are basically two types of automated door locks and these are magnetic and electronic. Both work on the same principal that requires a signal to be sent from the scanner for access cards and biometric readers before the lock will be released and the door or gate opened. While most people are quite au fait with the way access cards work, biometric scanners are more complicated and newer on the market. Both access cards and biometric readers have the same application though and that is to limit access to an entire property or specified restricted areas within a building. Access cards and biometric readers are more commonly used in office, commercial, industrial and other work related environments. Many of these types of establishments are starting to replace their systems for access cards and replacing them with biometric readers. This is mainly due to the fact that biometric readers are nearly infallible whereas the duplication or unauthorised production of access cards has become relatively easy. Theft of access cards is also possible whereas biometrics cannot be stolen and duplication is difficult and nearly impossible. There are 3 types of biometric scanners that are being commonly used. The first and most well known of these is a fingerprint scanner that can be attached to an electronic door lock or to a computer to limit access. Iris scanners and hand mapping technology are becoming more and more popular and can be applied in the same way as a fingerprint scanner. All these biometric readers work in much the same way using an infrared light to read the unique qualities of a fingerprint, iris or entire hand. The biometric readers then access a data base that stores the information regarding the fingerprints, irises or hands of persons authorised to gain entry. If the reader finds the information stored in the databanks, the door lock is released but the door will remain locked for persons who have no authorisation for access. Probably the best way to ensure that you security measures are optimised is to use access cards and biometric readers in conjunction with one another throughout the work environment.Access Control in Pretoria Security Products For Access Control In Pretoria Everybody is always criticising the high crime rate in South Africa especially those expats who sit on the sidelines pointing fingers and saying how great life is elsewhere. The truth is that crime is problem around the world and people are always looking for ways and means to protect themselves from the criminal element. The best way to do this is to have the most effective measures for access control in Pretoria installed. There are many different types of security products on the market to assist you in improving your security measures through access control in Pretoria. The most basic of these is of course security gates the most innovative of these being retractable with an integrated slam lock. A slam lock on your security gates allows you to instantly lock and secure an area without the use of a key. Next you have electronic and magnetic locks. These can be used both in and out of doors for gates and doors. The electronic or magnetic mechanism normally works in conjunction with a keypad, swipe card scanner or remote control device to allow access through the door or gate. These types of innovative access control locks are ideal for use where many people require access to a premises or restricted area within a premises. As long as someone has the right password, magnetic swipe card or remote, they will be able to gain access. The latest security technologies involving access control in Pretoria are referred to as biometrics. Biometrics uses the human body as the password to gain access through electronic or magnetic door and gate locks. The most common of these are fingerprint scanners. Every person in the world has a unique fingerprint that can be entered into a computer security system. A fingerprint scanner can then read the print of a person trying to gain access and then access the computer data base to find whether they are authorised to enter and release the lock. Iris scanners work in much the same way except that the eye is scanned instead of a fingerprint. Hand mapping has also become quite popular in the world of biometric access control. It is important to research all the advances that have been made in access control technology to ensure that you have the most up to date security measures in place. Access Control Systems Intercom Access Control Systems One of the most effective access control systems that have been in use for many years is a simple intercom. An intercom can be placed at any main access points to a property or building as well as in other areas that require restricted access control. A person can relay information regarding who they are and their reason for wanting to enter an area without actually coming face to face with anyone. Most intercom access control systems work in conjunction with electronic locking mechanisms. These locking mechanisms are attached to the intercom allowing the door or gate to be opened at the push of a button. As no keys are required, these electronic door or gate locks provide a tamper proof security solution for access control. These intercom systems can also be used in union with a number of other access control systems. For example, the incorporation of a security or CCTV camera at the intercom access point can allow you to see and hear a person wishing to gain entry. These security cameras can record all relevant access control information and store the data so that it can be viewed at any time. A keypad can be added to your intercom device meaning that authorised persons with the correct password will not need to use the intercom system every time they need to enter a specified area. Remote control devices are another good way to grant access to authorised people without using the intercom system. Magnetic swipe or smart cards can also be used in this way. A panic button can also be integrated into you intercom access control systems. The panic button can be used to activate and alarm or send a silent signal to an armed response unit should an unauthorised person try to gain access. Alternatively, the intercom system can be assimilated into an existing alarm system that will both sound an alert and send a message to a security response team. There are many other products for access control systems that you can use to limit or totally prevent any entry to some or all people. Make sure that you find out more about these products before settling on only using an intercom or any of the above mentioned products for your safety and security.